The problem with leaving my radio-alarm volume turned down to a gentle background drone is that while I’m slowly waking up to another day, I often confuse the tail end of dreams with news reports; a state of affairs that, from time to time, has caused me considerable embarrassment. On one occasion, and still half-asleep, I mistakenly thought that the finance reporter was advising people to sell all of their socks. Fortunately for my comfort – if not my pride – a commodities broker friend who I consulted explained that there wasn’t actually much of a market for used socks emblazoned with pictures of Mickey Mouse. Which is why, when I recently awoke to a news report that several universities in different parts of the world were offering degree courses in surfing, I dismissed the idea as being just another sleep-induced delusion. Apparently, however, it’s true. Folks who want to advance their knowledge of surfing can now undertake a University course in the subject and receive, after completing several years of formal study, a Degree entitling them to put letters after their name. What’s even stranger is the fact that they don’t even have to know how to surf to be accepted into the programme. Leaving to one side any bias on my part, it struck me as odd that surfing – an activity based solely on a person’s ability to stand upright on a wooden plank while coasting along on the top of a wave – should be considered worthy of scholarly pursuit; especially when diving – encompassing disciplines like physics, physiology, chemistry, biology, engineering, mechanics, electronics, history, film-making, environmentalism and the like – is left out in the academic cold. The underlying reason for this apparent anomaly is, of course, obvious. 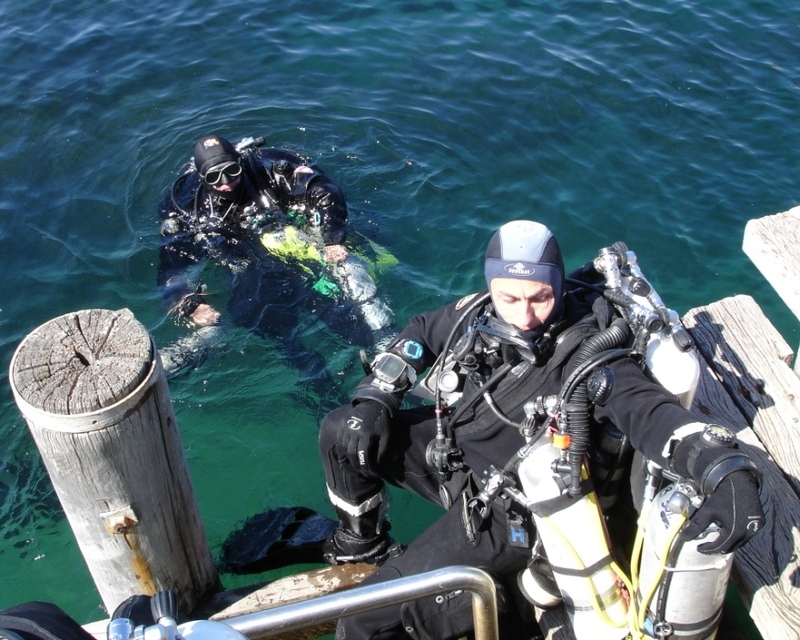 A Degree course in diving would not be in the best interests of either the global economy; universities and other tertiary places of learning; or of the diving industry itself. Rather than enrolling in Economics, Urban Planning, Social Sciences, or Law, the student demand for diving would undoubtedly see a decline in such subjects and the eventual closing of those university departments. Governments would be obliged to function with smaller bureaucracies; taxes would be lowered; there would be fewer traffic lights and confusing one-way street systems in our cities; ‘political correctness’ would be given the old heave-ho; and lawyers wouldn’t feel the need to chase ambulances in order to earn a living. It’d be the end of civilisation, as we know it. “Balderdash. It’s 291.67 bars*, a simple problem that any under-graduate diver could solve. Don’t believe me, eh? Go and ask, Krabbman over there. He’s already earned a Doctorate in Dive-Mastering with his controversial thesis on the molecular properties of wet-suit neoprene and, in the process, become an indispensable member of this dive boat’s crew. Come to think of it, there’s really no need for a formal Degree when some sectors of the diving community are already convinced that their approach to diving is, geometrically-speaking, the only right angle.